London's awash with afternoon teas, from the traditional to the quirky to the vegan. And new ones are always being added to the selection too — take a look at the menus making their debut in London this month, including special Easter afternoon teas. Some of them are only around for a short time, so book quickly if they take your fancy. Starhotels Collezione hotels (that's The Pelham, The Gore and The Franklin, all in South Kensington) aren't shy of partnering up with cultural neighbour, the V&A, for afternoon teas tying in with current exhibitions. We've had Winnie the Pooh, Frida Kahlo and Dior, and now, there's a Mary Quant afternoon tea, linking to the new exhibition about the designer. Partnering with event planning company La Fête, The Pelham has produced a sixties-inspired menu, featuring items with titles like 'Swinging London' and 'Quant's Crayons'. A lot of thought has gone into the presentation of items, with a raspberry coulis served in a nail varnish style bottle, and an edible 'lipstick' of dark chocolate. Specially created cocktails and mocktails are available alongside the afternoon tea for an extra charge. Mary Quant afternoon tea at The Pelham. £40, or £55 including a ticket to the exhibition. Peter Rabbit Afternoon Tea at The Terrace on Piccadilly inside Le Méridien Piccadilly. £35 per adult/£25 per child. 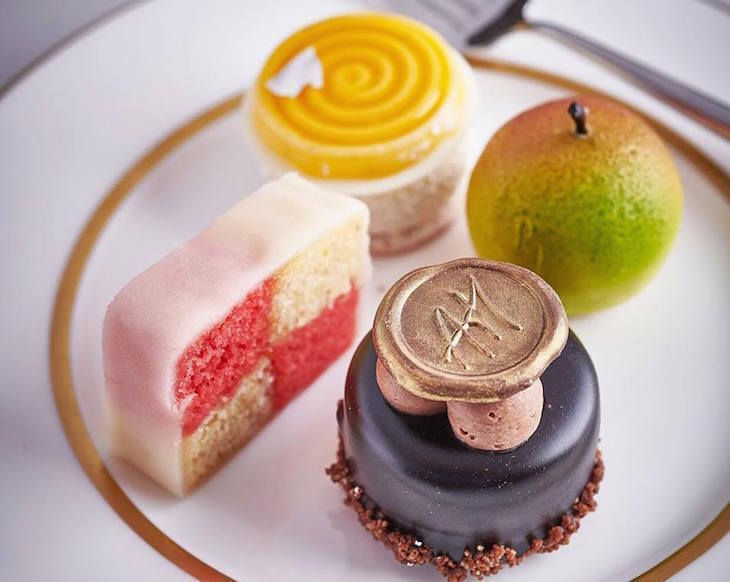 Chef Adam Handling teams up with pastry chef Chris Underwood to launch an afternoon tea at his recently-opened tea lounge. Focus is on using British ingredients to create international flavours, with treats including Granny Smith & lemongrass cremeux, passion fruit curd tart with coconut mousse, and salted caramel sacher with milk chocolate Chantilly. A choice of 17 blends from Newby Teas is available to wash it all down. 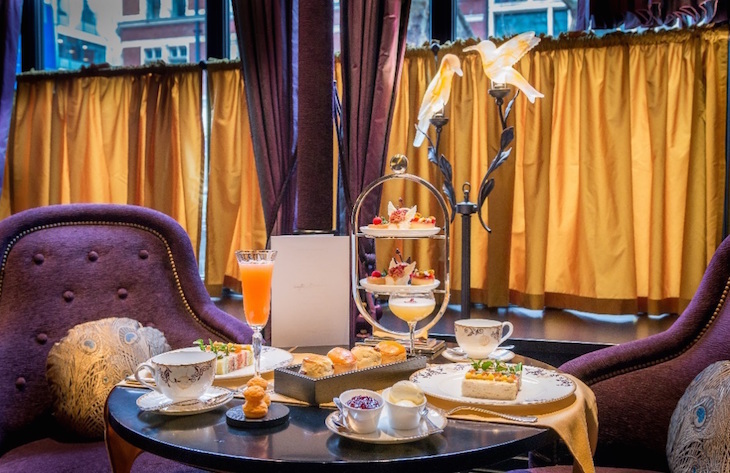 Afternoon tea at Cadogan's by Adam Handling, Belmond Cadogan Hotel, 75 Sloane Street, Chelsea. Located in Hotel L'Oscar, the new afternoon tea at Cafe L'Oscar takes inspiration from upstairs neighbour, The Baptist Bar — so expect things to get a bit quirky (the hotel itself is located in the form headquarters of a baptist church too). The menu consists of traditional sweet and savoury food with a contemporary twist, including Religieuse buns followed by sandwiches filled with the likes of devilled chicken and poached salmon. Finish up with Adam and Eve’s pudding, Devil’s food cake and Saint Nectaire and blood orange cheesecake. Saints can wash it down with tea while sinners can indulge in tea-based cocktails. £2 from each afternoon tea is donated to local homelessness charity Rhythms of Life. Saint & Sinner afternoon tea at Cafe L'Oscar, 2-6 Southampton Row, Holborn. £38 per person including tea, or £60 per person including three cocktails. 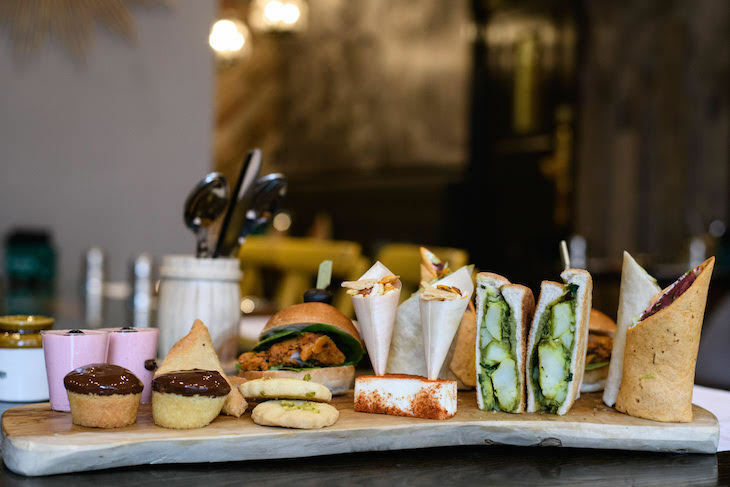 Indian street food restaurant Soho Wala is taking a bold dive into the world of afternoon tea, aiming to recreate "the authentic taste of the Indian marketplace" within the classic English meal. Highlights include coriander and mint chutney in brioche buns, Tandoor chicken morsels with fresh spinach, beetroot kebab wraps with beetroot yoghurt and lamb kathi rolls. Sweet offerings include apple and cinnamon samosa, chocolate barfi and sweet lassi shots. Drink Masala Chai or choose from a selection of herbal teas to accompany your meal. Unusually for an afternoon tea, it's aimed at the lunch hour crowd, prepared quickly for you to enjoy before heading back to your desk. Soho Wala afternoon tea at Soho Wala, 21 Great Marlborough Street, Soho. £25 per person. 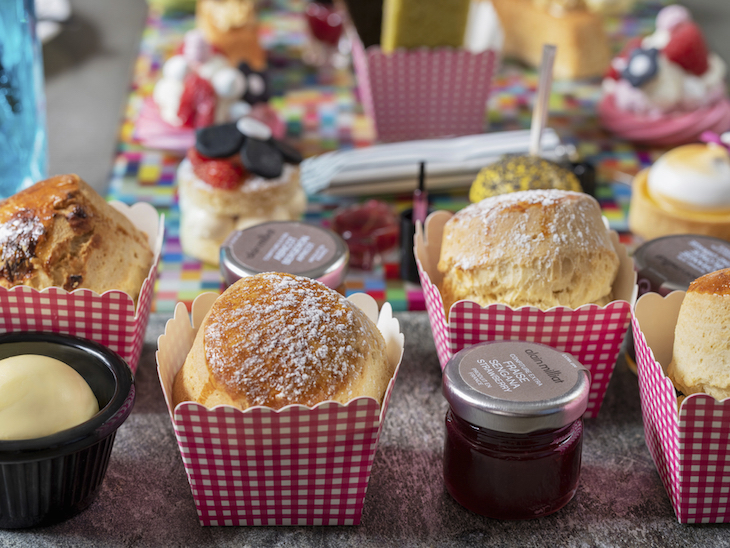 For a dose of patriotism overlooking the Tower of London, this new Crown Jewels afternoon tea focuses on the best of British, with a fancy twist. On the menu, British classics including egg mayo with truffle oil, coronation chicken, and minted cucumber sandwiches. Pastries include a cherry and liquorice macaron topped with a silver jewel, and a chocolate tart with fresh raspberries, topped with gold leaf. Crown Jewels afternoon tea at Rotunda, Four Seasons Hotel, 10 Trinity Square, Tower Hill. 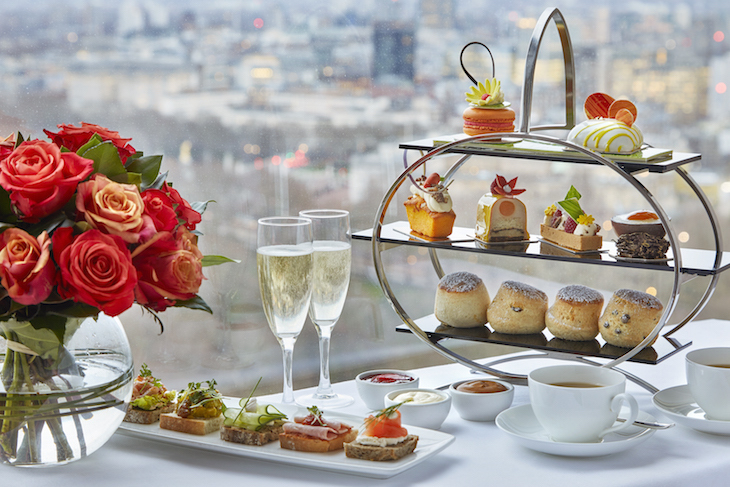 Crown Jewels afternoon tea £35/Champagne afternoon tea £38. 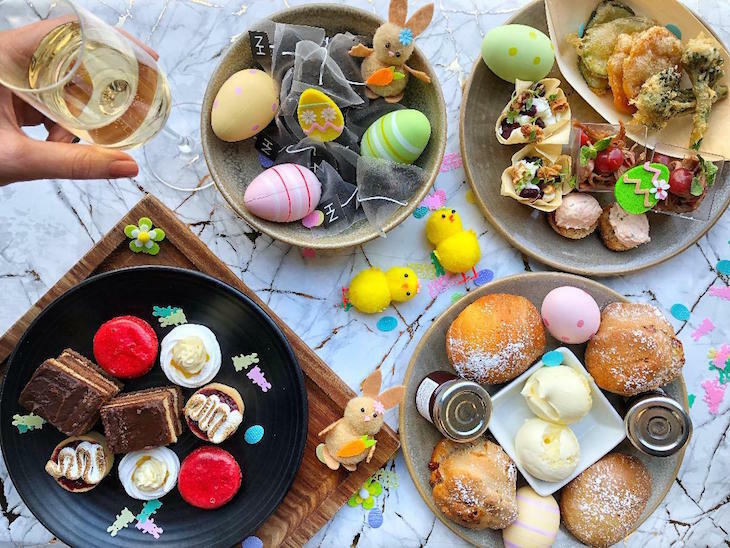 The usual afternoon tea gets an Easter twist at The Podium restaurant and bar. Begin with classic sandwiches including smoked salmon and horseradish cream, and cucumber, chive and cream cheese, then choose from salted caramel spread, Cornish clotted cream or strawberry jam for your scones. Finish off with miniature fancies including mango and vanilla half chocolate egg, carrot cake, and passion and white chocolate tart. Easter afternoon tea at The Podium, London Hilton Park Lane. £39 per person/£49 with champagne. For two days only, the rather swanky Berners Tavern offers an Easter afternoon tea. 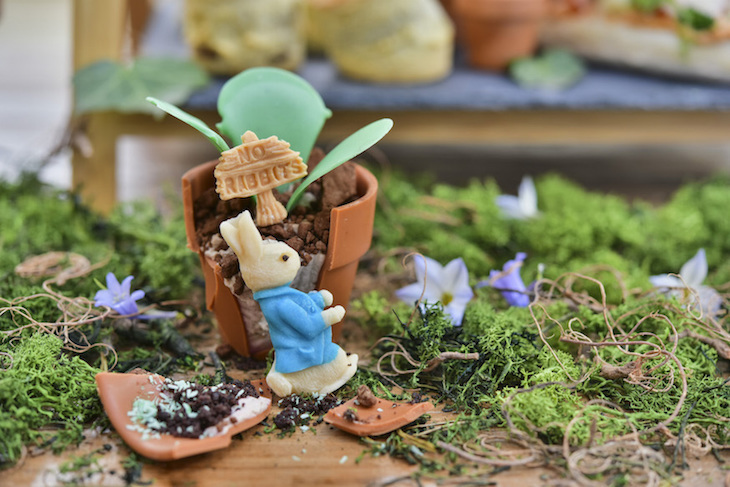 Jason Atherton's patisserie team have compiled a feast including spiced ginger and milk chocolate macaron rabbits, coconut mousse, mango and coconut shortbread eggs, and carrot cake plant pots with cream cheese frosting. Available: 20 & 21 April. 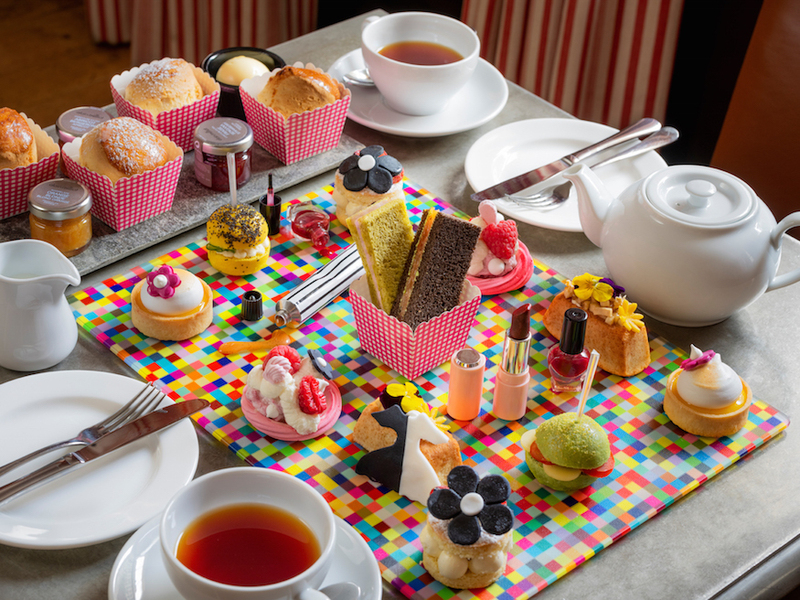 Chocolate is the focus of the Easter afternoon tea at upmarket Knightsbridge department store Harvey Nichols, where a selection of cocoa-based treats round off a meal of traditional sandwiches and scones. The menu includes a trio of chocolate macaroons with a white chocolate Easter egg, a hazelnut, caramel and chocolate sponge, a white chocolate exotic mousse, chocolate pavé with passion fruit crémeux and a chocolate verrine with caramelised macadamia. That's a whole lot of chocolate. Easter chocolate afternoon tea at Harvey Nichols Fifth Floor Cafe. £35 per person/£45 with bottomless prosecco.